This watch arrived and was almost perfect. It was attractive and working in the box. However, the diameter of the case was too large for the wrist for which it was intended. It was 35mm and I needed one around 22 - 25mm. Unable to resolve this I reluctantly returned it, which has been handled beautifully. 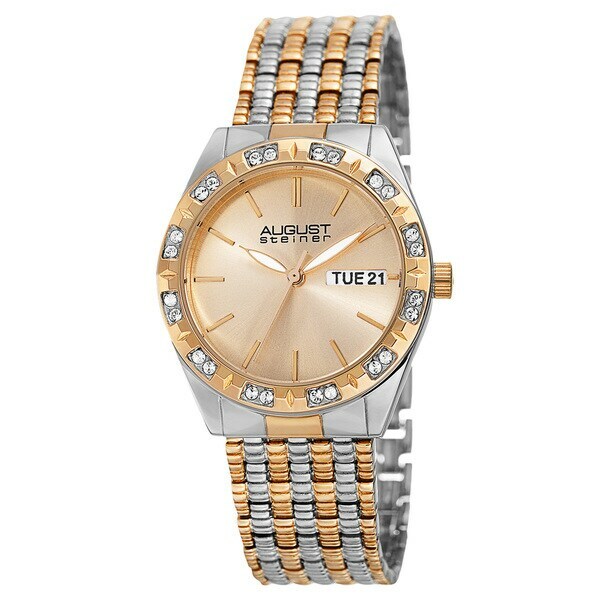 This August Steiner women's timepiece features beautiful Swarovski crystals along the bezel. It is powered by the reliable Japanese quartz movement and has a sturdy alloy bracelet. The simple and elegant design makes this watch chic and unique. This product was defective and I had to send it back. The clasp was hard to close and eventually broke off. I received it on Wednesday and the clasp broke on Saturday. The medal used for the band is cheap. It was taken back without any question and a refund was pormptly given. Excellent price and availability. Its appearance is very appealing. It was a quartz, the band was silver and gold and it had Dostoevsky crystals.